I went to a writing workshop today, run in conjunction with an exhibition at the British Museum called Ice Age Art: Arrival of the Modern Mind. We spent some time looking at the exhibits and absorbing the atmosphere of life in Europe 10 – 40,000 years ago. Then we were invited to write something in response to what we had seen. 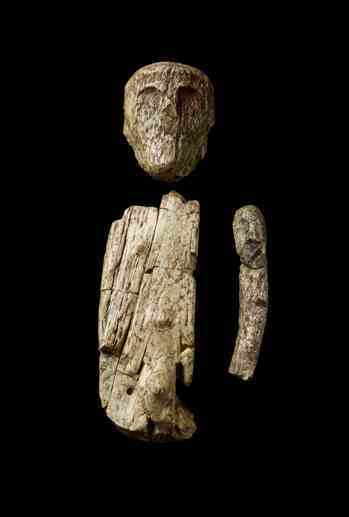 I was really struck by the remains of the earliest known puppet/doll – shown in the picture above – and this is what I wrote. I am the Tellerman. I speak to all things. They speak to me. This is how they speak: I hold Man on my knee. He moves. His arms and legs move. No-one else has a Man. I made him a long time ago. I had a picture of him in my head and I made him: Man, his arms and legs moving on my knee. I hear him speak. He moves. He looks. He knows what all things speak (“large” and “small”, “long fur”, “great tooth”, and “good to eat”). He walks on my knee. I bend down so he can speak in my ear. I listen to what he says to me: “Hunt – stay home – danger – plenty.” I tell the people. I am their voice. I am their ears. Man is silent during the day. He only speaks at night when the fires are lit. Sometimes Man leaps off my knee and grows big. He jumps onto the wall of the cave. He hunts and he fights. Sometimes he says nothing. He sleeps. If the people give us food, he tells stories. He knows many stories. He speaks them into my ear and I tell them, He dances on my knee; he jumps onto the wall of the cave. He hunts and he fights. It is a fabulous exhibition. Do see it if you can. Write something and post it in reply! Love your blog, Geoff. Greetings. Arrived here via Peter Reason commenting on an EarthLines post, but I see we have Emerson in common – I was a long-term tutor on their summer Poetry OtherWise course, and know Ashley etc. PS reading your article on ‘Coming Home to Story’ I wanted to say that the intro to one of my early books, ‘Creative Novel Writing’, based on a course I teach called ‘Storymaking’, looks at the archetypal origins of storytelling in a way that is I think resonant with your own, though different in focus. I’ll check out your book.